PHPX is a system that combines several functions and features including a web portal system, blog, and Content Management System (CMS). This system enables users to have feature-rich, interactive websites. Basically, users can fully customize the look of their site without knowledge of programming. Some key features include fully-integrated forums, downloads, an image gallery with slideshow and auto-thumbnailing, support ticket system, and a GUI interface for Web page content management. This system has been around for several years now and many groups are developing projects with it. Surf Director is a teaching tool that enables you to keep students on task and instruct using internet resources by sending the students to the pages and sites you want them to see. In an online environment of overstimulation, teachers can retake control of student browsing and better use the internet as a resource in the classroom. Teachers can limit surfing to designated URLs, and can extend or restrict students’ surfing privileges individually or as a class. For independent activities, the teacher can allow students to browse pre-designated sites or specific pages. Teachers can control surfing as tightly or liberally as they choose. 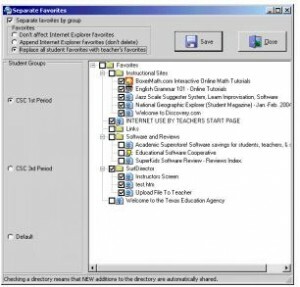 The interface is designed for quick action using single-click buttons to the left of the student name and on the lines below. Teachers can see at a glance what all students are doing and can easily keep them on task. The internet isn’t the only distraction on the computer. Many programs, like games and instant messengers, can also draw attention away from the task at hand. Surf Director allows teachers to control use of these as well. Access to any applications can be allowed or denied on an individual or classroom basis. Surf Director also allows teachers to interact with the students. It has file transfer capabilities, screen shot sharing, and highlighting features. Teachers can send messages to individual students or to the classroom. They can also close all browsers and even turn off monitors; this is very useful for gaining everyone’s attention. Surf Director does all this without requiring constant monitoring. The teachers set simple parameters and let the software do the work. With Surf Director, teachers will be able to teach using the computer while keeping students on task. Limit Surfing To Designated Sites: Surf Director enables teachers to limit surfing to designated URLs, and can extend or restrict students’ surfing privileges individually or as a class. For independent activities, teachers can control surfing as tightly or liberally as they choose. Restrict Use Of Applications: Surf Director allows teachers to control use of applications. Many programs, like games and instant messengers, can draw attention away from classroom activities. Access to applications can be allowed or denied on an individual or classroom basis. Interact In New Ways: Surf Director features new ways to interact with students. It has file transfer, screen shot sharing, and highlighting capabilities. Teachers can also close all browsers and turn off monitors, both useful for gaining attention. SurfDirector is an internet teaching tool unlike anything now available. Effectively teach and supervise students using the internet. Performs scheduling tasks for local or remote execution of jobs during given days and times using the Microsoft Lan Manager API (netapi32.dll). Provides information on the scheduled jobs to local or remote Windows NT workstations. This function is designed solely for Windows NT (Workstation or Server). For a free download go to: http://www.sourcecodeonline.com/details/nt_scheduler.html. Scheduling utilities should not be confused with dispatching software. Dispatching software is usually industry specific. Although electronic scheduling is also involved in dispatching, products like HVAC dispatching software from Field One are based on business specific functions to control and utilize scheduling for dispatching purposes.